Appel Farm’s friendly and professional teaching artists will work with your troop to earn their Visual and Performing Arts badges during one of our 90 minute Girl Scout Workshops, held in our spacious, state of the art studio facilities. Your troop may also utilize our designated meeting room for a 30-minute period before or after your workshop for snacks or to hold a meeting. Photography and Build your own Badge for Ambassadors. Is there a Badge that your Troop is interested in earning that you don’t see here? Let us know and we will design a workshop specifically for you! 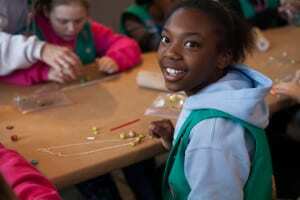 Click on the link to view our badge workshops. We look forward to working with your troop to transform their lives and help you to build girls of courage, confidence and character, who make the world a better place!